The Heritage and Information Centre opened in 2004 and has, in addition to the permanent exhibition, specific exhibits set-up on an annual basis. The Centre is on the site of an old forge, built in the 1790s, which was in the continued occupation by the Pearce family. They operated here until 1966, after which time it was converted for use as an artist’s studio. 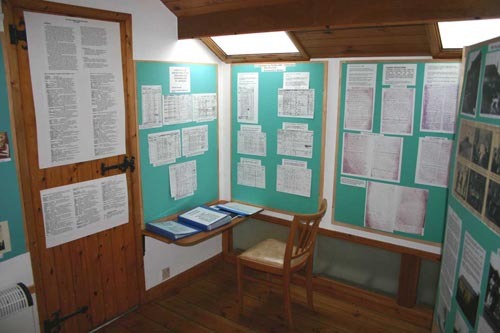 The history of the parish is illustrated with displays depicting Farming through the Ages, the Fishing Industry, Education, Doomsday Book entries, the Manors, World Wars, Coastguards, Churches, Chapels and much more, all illustrated by photographs, tithe maps, documents, parish records and other artefacts. For those with an interest in family history there is a database containing the baptisms/christenings, marriages and deaths/burials of more than 11,500 parishioners. Indexes are also available for St Gerrans and St Anthony parishes covering, baptisms, marriages, burials and a churchyard plan. The 1841 – 1901 censuses have also been indexed. Details of Local Services and Accommodation are available. The computer may be used for scanning, copying and email. 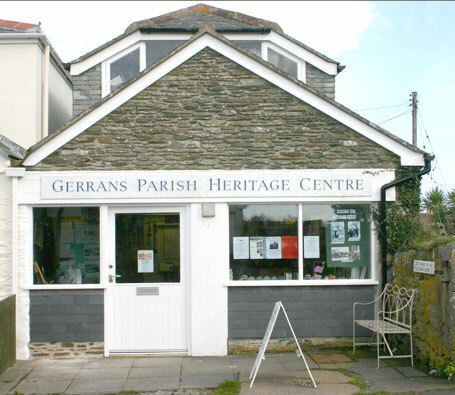 For details of opening hours and annual exhibitions please visit the Gerrans Heritage Centre website. The email address given on the Heritage website does not appear to work!